As the hype dies down, what’s next for China’s live streaming industry? On a Tuesday night in July in Beijing, Melilim Fu, a Chinese beauty blogger, was ready to go live with her bare face. 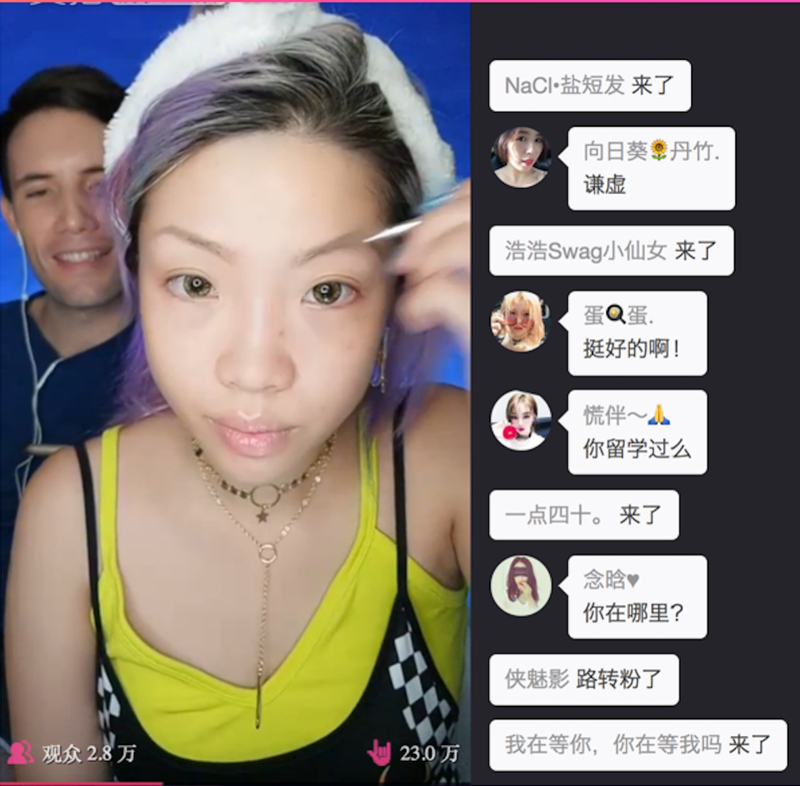 With some help from her video producer boyfriend, Elijah Whaley, who also happens to be a KOL (key opinion leader, 网红 wǎnghóng in Chinese) marketer, Fu set up the camera in the apartment studio, grabbed her palettes and brushes, and tidied up her hair with a white headband. She was ready to give her followers a live tutorial on how to recreate Sarah Snyder’s look. With a huge social following of over 400,000 followers on Weibo, the Chinese equivalent of Twitter, Fu’s live shows on Meipai attract tens of thousands of views for one single broadcast. As a professional makeup artist, she first started out with blogging about beauty, and soon in 2016 began to run live shows to update her daily life with her fans as live streaming took off. The live streaming craze hit China quick and fast in 2016, leading to a boom of more than 200 live streaming platforms actively involved in the sector. However, it seems that the hype is cooling down. “The hype [of live streaming] is down, not there anymore,” said Ashley Dudarenok, founder of ChoZan, during a phone interview with TechNode. She has worked with Chinese social media for over 10 years. “However, people are still checking our [live shows],” she said. In fact, China’s live streaming market was estimated to be RMB 20.8 billion ($ 3 billion) in 2016 with an 180% year-over-year growth, according to the report by Internet market research firm iResearch (in Chinese). However, the latest report from QuestMobile shows that the mobile user scale for live streaming apps is on the decline (in Chinese), dropping from 104 million monthly active users in January 2017 to 91 million in June. Many live streaming startups are not doing so well either. Just last month, ME—a YY-backed live streaming app that once boasted 10 million active users (in Chinese)—went offline. In May 2017, China’s leading live streaming service Inke (映客) sold about half of its equity to Shunya group. Earlier this year, live streaming platform Guangquan (光圈直播), once valued at RMB 500 million ($ 74 million), went bust after burning through its cash. Troubled by the lack of stable business models and undifferentiated content, live streaming platforms are undergoing a competitive reshuffle. 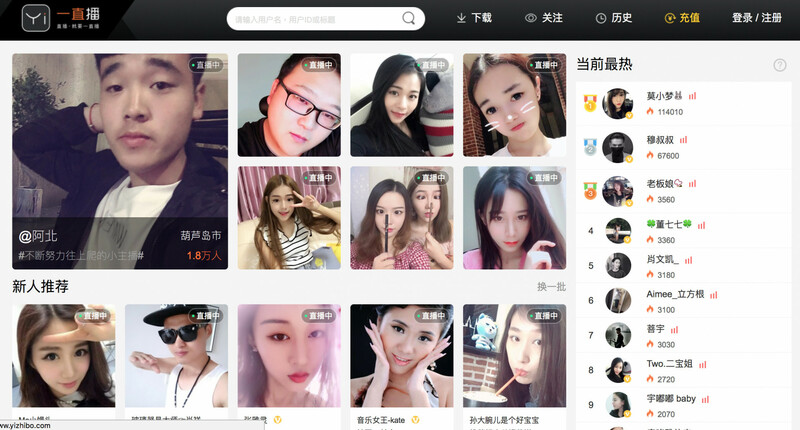 It didn’t come as a surprise when Weibo, in cooperation with Yixia, launched the live streaming service Yizhibo in May 2016, enabling users to not only document and broadcast their lives but also to receive virtual gifts. Yizhibo has been doing quite well and has topped the chart with its humongous user scale of 59.7 million monthly mobile users in June 2017, according to QuestMobile. “So everyone started live streaming, and this craze continued for one year,” said Dudarenok. There are two types of live streamers: KOLs and those who rely heavily on live streaming and mostly make money from virtual gifts—virtual flowers, diamonds, sports cars and so forth that represent real money. These web celebs are usually backed and trained by talent agencies that teach them how to perform, sing, dance and chat in front of a camera. Some even quit college to do this full-time. Some fashion bloggers have started to produce live online tutorials, while some others rise to fame by eating, singing or dancing in front of their web cams. These well-known bloggers, or KOLs, who already have a huge following on social media don’t rely on tipping or virtual items of “traditional” live streamer. Rather, they turn a nice profit from ads and endorsements. “Content is the most important thing when it comes to live streaming,” said Fu. “For me, it’s like a TV show, just distributed through a different channel. And it is more real. I can jokingly hit my boyfriend sitting next to me whenever I feel like it during the live stream,” she said. While live streaming startups struggle with operations and live streamers strive to please the audience with better content, China’s authorities are paying more attention to the industry as it evolves. After all, having millions of people broadcasting in real-time online is an anomaly for the country’s highly regulated internet scene. “I think live streaming is definitely there to stay. It’s just how much the government will allow it to flourish,” said Dudarenok. The government has introduced a raft of regulations and shut down dozens of live streaming services. Just last month, the authorities ordered Weibo, news website iFeng, and video sharing and game streaming platform ACFUN to halt their streaming services for being out of line with national audiovisual regulations and “promoting negative comments” (in Chinese). Yizhibo, however, has only seen closed accounts that comment on domestic and foreign currents. Despite all the uncertainties of the future of live streaming, it is becoming a larger and larger part of e-commerce. “The most popular way to live stream for business is still on Taobao,” said Dudarenok. So much so, in fact, that netizens have quipped that Taobao isn’t making content for products; it’s making products into content. As the largest C2C marketplace in China, Taobao stands out as its streaming goes directly to sales. Internet celebs find various ways to monetize their social following through Taobao’s live streaming platform, where they can model their own clothing brands or go on shopping trips to promote Taobao’s various products—from food to maternity and baby care. “[Taobao’s live shows] are a little bit like those infomercials on American TV back in the 90s or early 2000s, where the host would hop on stage, show you that pan and keep repeating its benefits,” said Dudarenok. Indeed, these web celebrities offer a whole new purchasing experience for consumers and bring in a lot of money for China’s supercharged eBay. Top live streamer on Taobao, Zhang Dayi, made RMB 300 million ($46 million) in sales in 2015, while another online star Zhu Chenhui generated RMB 150 million ($22 million), according to data from brokerage Guotai Junan Securities. For Fu, it’s her professional makeup skills. 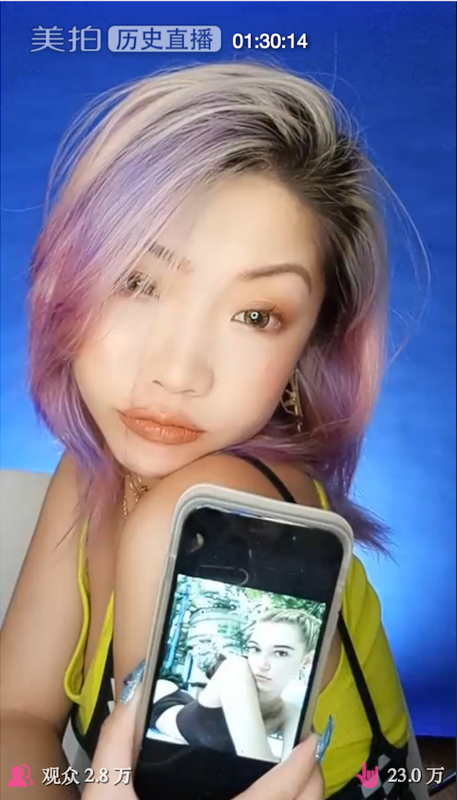 As Fu finished up with some final touches using a setting mascara, she finally took down her headband and posed in front of the camera, while holding up her phone displaying a photo of Sarah Snyder. “She’s so good at posing. It’s so hard to twist your body like this,” Fu cracked up as she talked to her fans, adding that she would do a Bella Swan makeup tutorial for the next live show.